Assassins Creed Origins is built by the same team that made Assassins Creed IV: Black Flag. They are known for reinventing the design and game philosophy of the Assassins Creed saga and their latest title shows that. Based in Egypt, the open world action RPG shows its graphics strength in all corners. It uses the AnvilNext 2.0 engine which boosts the draw distance range and delivers a very impressive graphics display. We tested the game at maxed settings with TAA enabled and 16x AF. Do note that the game is one of the most demanding titles out in the market and as such tweaks and performance issues are being patched out. The final chapter in the Batman Arkham series, Arkham Knight, is a great hack’n’slash title. It features a great storyline, however, the PC version was plagued with several issues at launch, but was fine tuned as time went on. Now, the game delivers an impressive visual quality and is very well optimized for the PC platform. The game comes with NVIDIA’s GameWorks technology but we will be keeping those disabled for a fair test showdown. 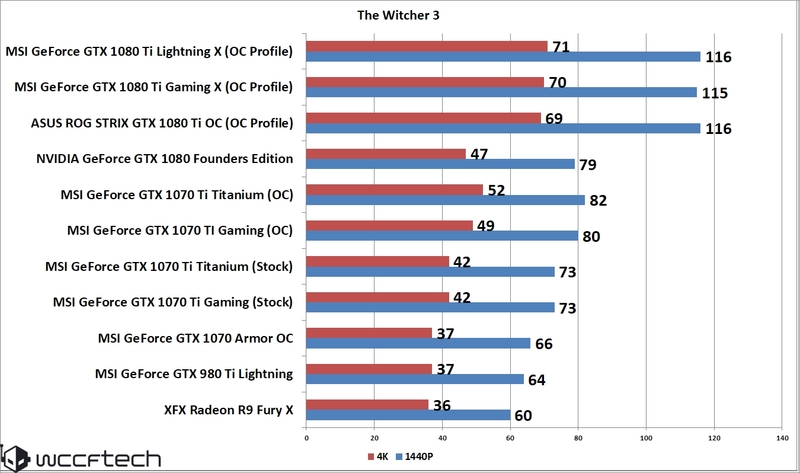 The game does well on GeForce and even AMD cards with most hitting north of 100 FPS at 1440P. At 4K, most of the high-end cards, including the GTX 1070 Ti, manage to close in at the 60 FPS mark. 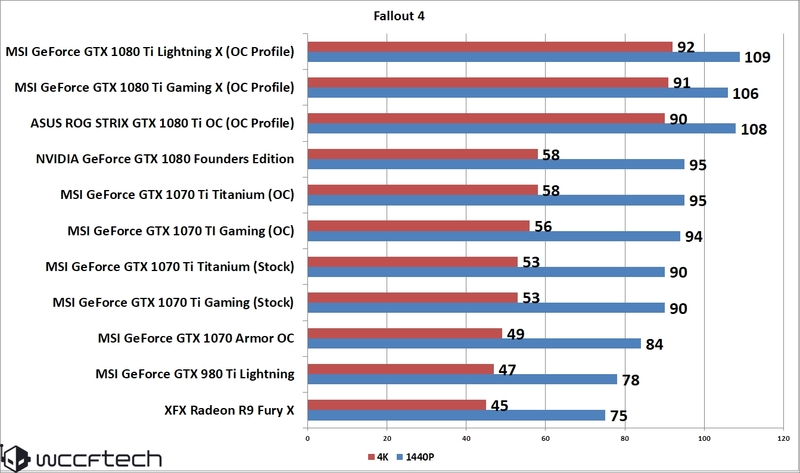 Fallout 4 is a great addition in the Fallout universe. Fallout fans like me have fallen in love with this new game since it was released. 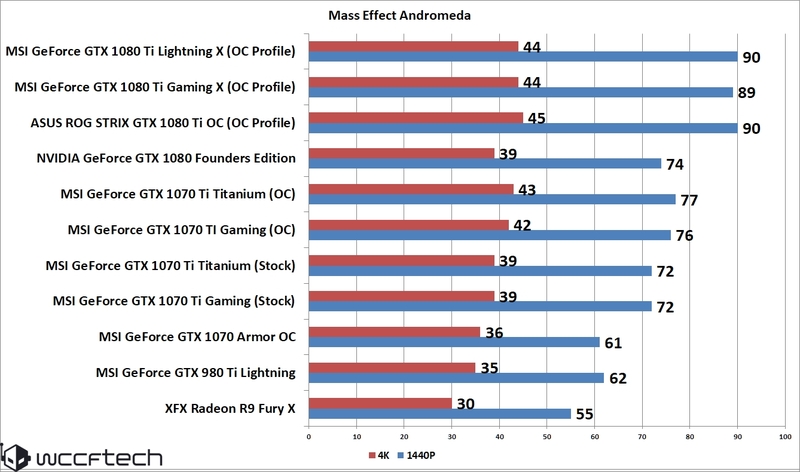 Being a huge fan of RPGs and especially Sci-Fi RPG (Mass Effect for life), the game has the most advanced version of the Creation engine which was recently updated with NVIDIA’s GameWorks feature. The latest Hi-Res texture pack was released a while ago and weighed in over 50 GB which is mind boggling for a texture pack. I mean, what the hell Bethesda? 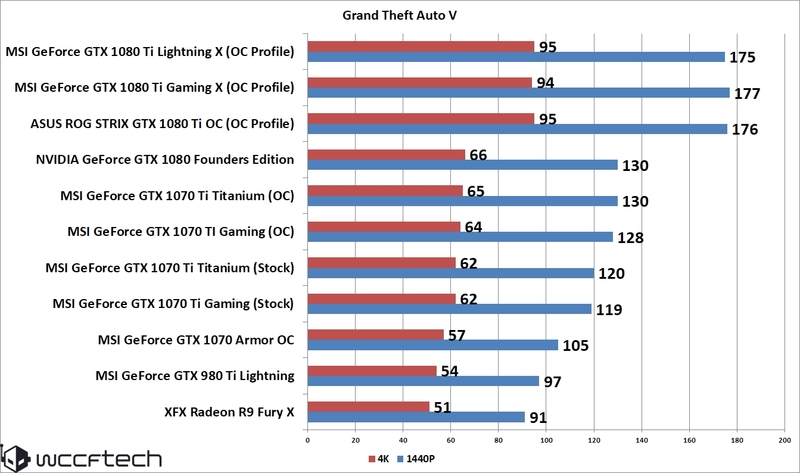 GTA V is the most optimized gaming title that has been made for the PC. It’s so optimized, it even runs on my crap GT 840M based laptop with a smooth FPS on a mix of medium/low settings. I mean what??? Aside from being optimized, GTA V is a great game. It was the Game of The Year for 2013. At 1440p Ultra quality, the game gave us smooth frames on all cards tested. 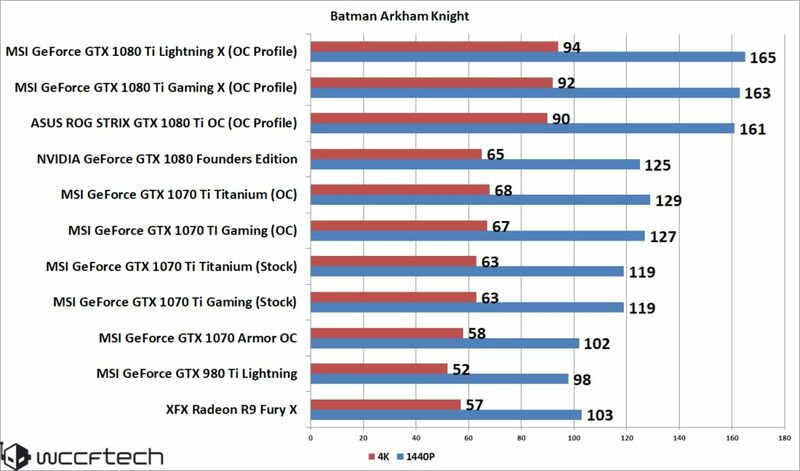 At 4K, we saw the GTX 1070 Ti reach over 60 FPS and pretty close to the reference GeForce GTX 1080. Using the new Anvil Next engine that was developed by Ubisoft Montreal, Ghost Recon: Wildlands goes wild and grand with an open-world setting entirely in Bolivia. This game is a tactical third person shooter which does seem an awful lot similar to Tom Clancy’s: The Division. The game looks pretty and the wide scale region of Bolivia looks lovely at all times (Day/Night Cycle). Here, the GTX 1070 Ti manages around 48-52 FPS on 1440P while lacking somewhat in the 4K gaming field with an average framerate of 34 FPS when overclocked. Witcher 3 is the greatest fantasy RPG of our time. It has a great story, great gameplay mechanics and gorgeous graphics. This is the only game I actually wanted to get a stable FPS at 4K. With GameWorks disabled, I gave all high-end cards the ability to demonstrate their power. 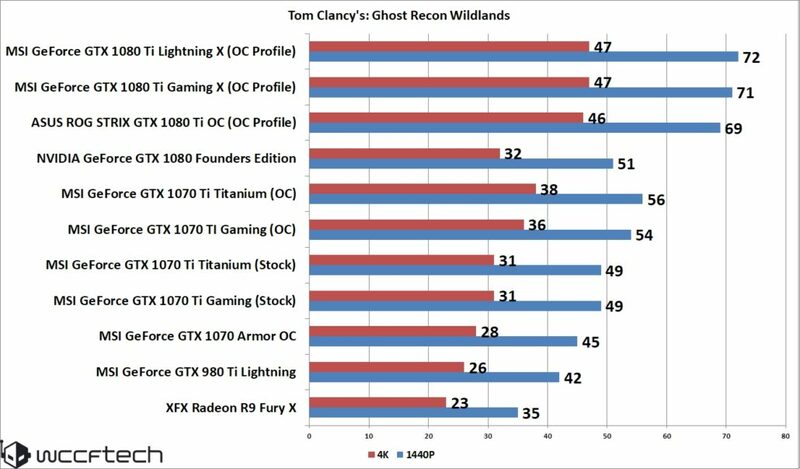 The GTX 1070 Ti delivers a smoother frame rate than the GTX 1070, with 55 FPS at stock and 60 FPS when overclocked at 1440p. 4K can be achieved but by toning down the visual quality as the card hits around 50 FPS when overclocked, under full details. 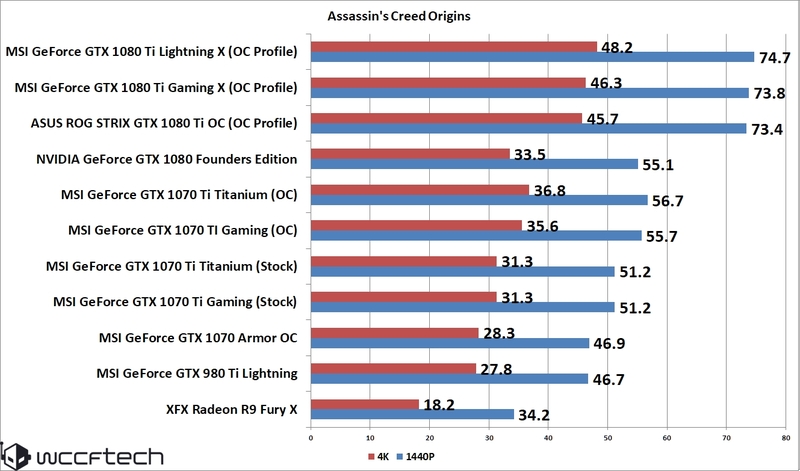 This means that the game has to be a bit graphics intensive which it is. The GTX 1070 Ti, GTX 1080, GTX 1080 Ti and the 980 Ti Lighting can hit 60 FPS or 60+ FPS (for 1080 / 1080 Ti) at 1440P but 4K means you need to sacrifice a little visual quality to hit the golden 60 FPS mark. 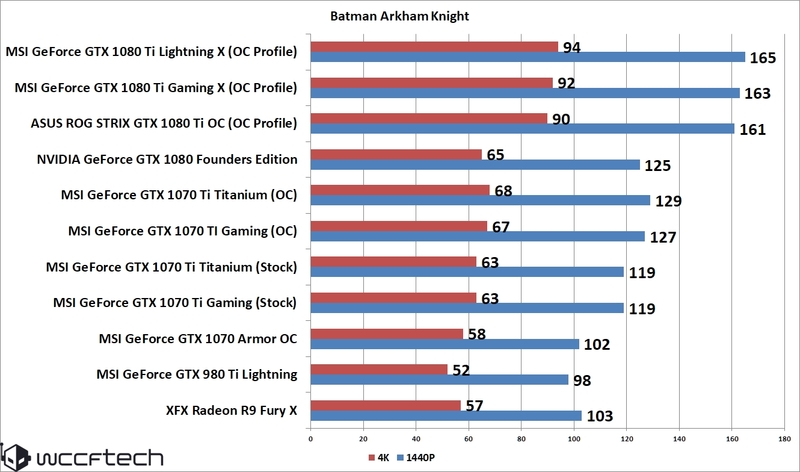 Here, the 1070 Ti Gaming achieves around 39 FPS with the reference profile and 42 FPS average after a manual overclock. 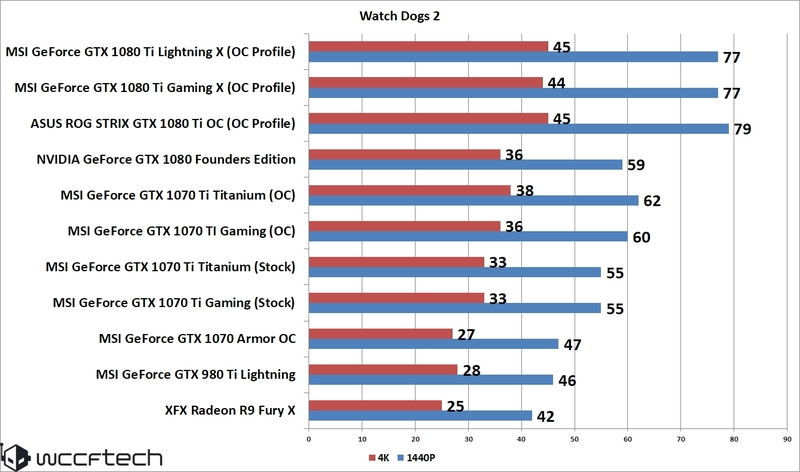 Like other titles we tested, reducing the visual quality by a bit can result in better performance that can reach or even exceed the 60 FPS barrier.